Cosy rooms, great breakfast, short distance to Playmobil Funpark: Hotel Knorz in Zirndorf is one of the most popular accommodations for a trip to Playmobilland Germany. Enjoy your stay at a great price: Find a cosy guesthouse, a recommended hotel or a top equipped camping site around the Playmobil Funpark Zirndorf! 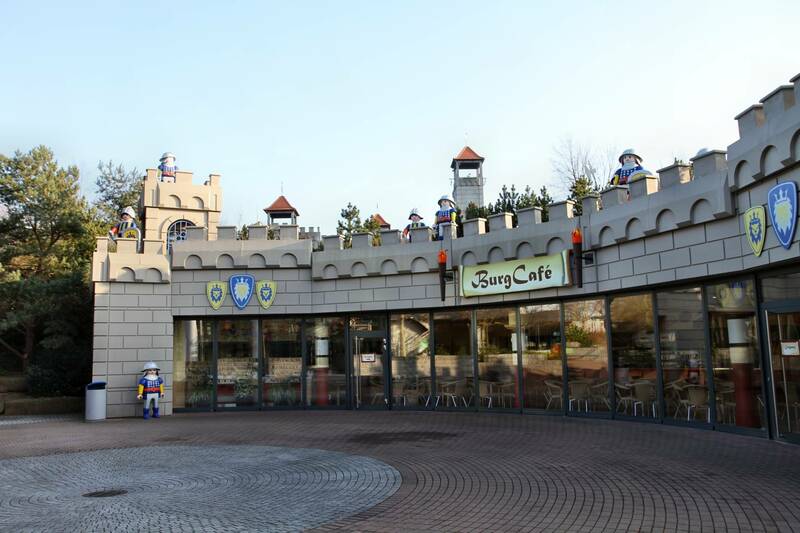 No matter whether the Playmobil Funpark is your primary destination or whether you are „just“ passing through: In Zirndorf and the surrounding area there are a whole range of recommended accommodations – from inexpensive to high-priced, from simple to noble. Some hotels and guesthouses are located in the immediate vicinity of the amusement park and can therefore be easily reached on foot or within a few minutes by car. 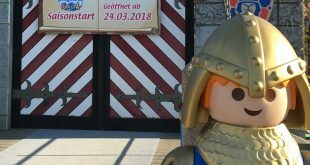 If you would like to combine your visit to the region with a tour of the imperial city of Nuremberg, you can of course also stay overnight there and then arrive at the Playmobil Funpark in 15 to 20 minutes. An overview of hotels, guesthouses and holiday apartments around the Playmobil Funpark, the daily updated prices and the available rooms can be found in this hotel overview at Booking.com*. Our tip: Several hotels in the region have explicitly adapted to Playmobilland guests – be it through family-friendly apartments, attractive all-inclusive rates, included tickets or lovingly designed indoor and outdoor play facilities. Interested? Then it is worth taking a look at this article. That’s as close as it gets: The Playmobil Aparthotel is located directly opposite the main entrance to the Playmobil Funpark. Depending on the season, the prices for overnight stays range from 164 to 180 euros for a maximum of two adults and two children. There is an surcharge for a baby cot. Each additional child gets a bed in the room for ten more euros. Breakfast can be had at the HOB-Center: For an acceptable 11,90 Euro (adults and children from 12 years) and 7,90 Euro (children between 3 and 11 years) you can expect a sumptuous breakfast buffet. You can also take advantage of this offer if you do not stay overnight in the Aparthotel – more information can be found here. 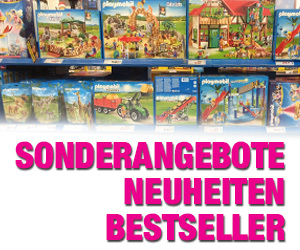 During the Nuremberg Toy Fair (end of January/beginning of February) a hefty surcharge on the overnight prices is demanded – however, during this period only business travellers or exhibitors will be dependent on the room anyway. The Playmobil Aparthotel was completely renovated and modernised between October 2016 and March 2017 and celebrated its reopening on 8 April 2017. The building now has 28 guest rooms, each with 38 square meters of living space. 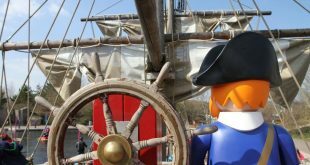 For the 2018 season, the Playmobil Hotel has put together various season packages, each of which includes one overnight stay, breakfast and park admission for two adults and two children. Package price: 255 Euro (spring/autumn) or 285 Euro (summer season from 1.5.2018 to 10.9.2018). The Hotel Knorz in Zirndorf is a classic Hotel Garni. The modern rooms are bright and friendly, Wireless LAN and parking spaces are free. Special mention should be made of the delicious breakfast buffet with a view of the „Knorz Gardens“ with terrace, spectacular tree houses, play equipment, sandbox and cheeky squirrels. Playmobilland can be reached by car in five minutes; if you want to walk, you should plan about half an hour for the approximately 1.5 km. When you see the pyramid-shaped hotel complex, you feel like you’ve been back to Las Vegas. Behind the glass façade is a 4-star hotel with all comforts and modern rooms, which were completely renovated in 2017. 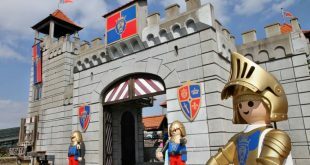 The access road to the Playmobil Funpark is only a quarter of an hour away – you are at the gates of the amusement park. You can choose between 104 rooms in the categories Standard, Superior, Executive and Deluxe, and there are also special family apartments. They all have air conditioning, free Wi-Fi, a 43-inch TV, high-quality mattresses and many other amenities in common. Two handicapped-accessible rooms with wheelchair-accessible showers and lowered washbasins are a special feature that cannot be taken for granted. You can easily park in the adjacent underground car park. In Oberasbach – a neighbouring village of Zirndorf – lies the four-star Bomonti Hotel. The big advantage: From Bomonti you can reach the Playmobil Funpark in a short walk (maximum 15 minutes), by car it is five minutes. This hotel has also put together a Funpark package that includes two nights in a family room, two breakfast buffets, three or four tickets, a parking space and a bottle of mineral water. The prices vary according to season and start from 235 Euro in the low season for two adults and one child up to 12 years. For two adults and two children in the high season we charge 295 Euro – all other rates are in between. An overview of the arrangements can be found on the website of the Hotel Bomonti. The hotel is only a ten-minute walk from the Playmobil Funpark in a Zirndorf suburb. The small and well-equipped rooms have TV, bath, shower and hairdryer. Top: WLAN and parking spaces are free of charge. A breakfast buffet is also served. The Parkhotel Zirndorf has a special offer especially for families: special Playmobil Funpark packages are available on request, starting at around 110 euros for two adults and up to three children. The 15 renovated rooms have free WLAN, a TV and shower/WC. 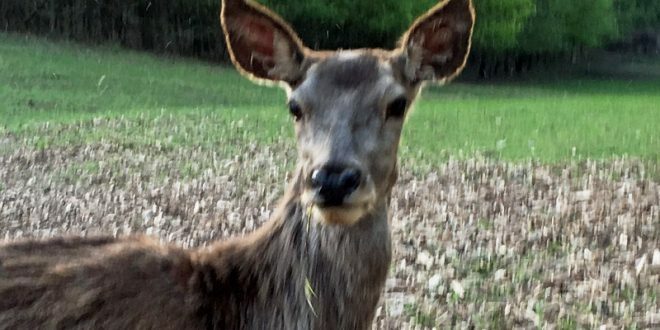 The Parkhotel is particularly quietly located on the edge of the forest of Zirndorf. 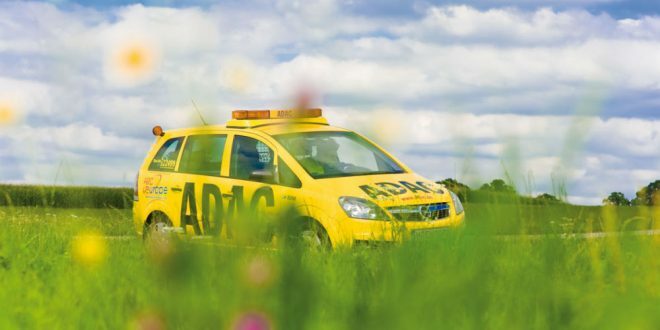 Nevertheless, the city centre is only a ten-minute walk away. Just like the Parkhotel Zirndorf, the Seerose-team has adapted to the Funpark guests. A modern equipped family room with four beds for two adults and two children in the Landhotel Seerose costs about 110 Euro. WLAN and breakfast buffet are always included in the price – great! 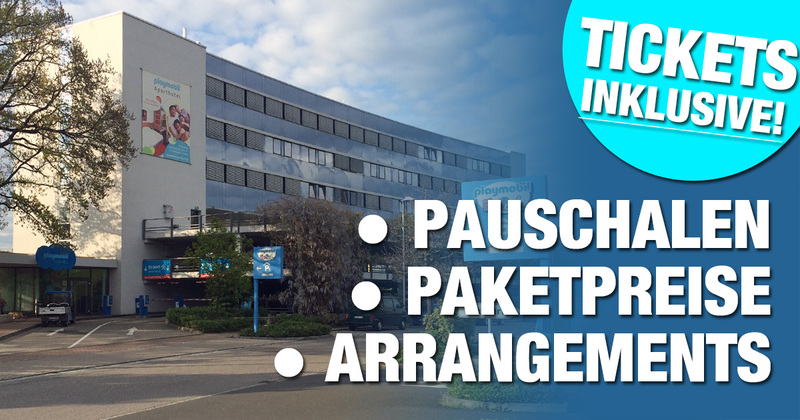 The term „Landhotel“ is not chosen by chance: The hotel is located in the city of Langenzenn, about 20 kilometers (= 20-25 minutes driving time) from the Playmobil Funpark. Hotel and inn form one unit and also include a sauna and wellness area with solarium. 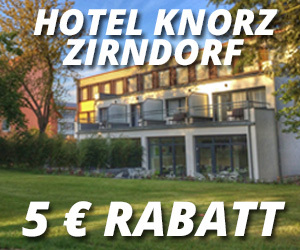 The Zirndorfer Hotel has four stars – an exception in the Zirndorf area, which is of course also reflected in the rate. Breakfast buffet and parking spaces are included in the overnight price. If you want to use the WLAN, you pay five euros per 24 hours. The Playmobil Funpark is about 3 km from the hotel (= five minutes drive). In the middle of Zirndorf, directly opposite the town hall, the Gasthof Bub is located in a magnificent half-timbered house. The guest rooms are simple but comfortably furnished and have a TV and a bathroom with shower. WLAN access is free, as is parking for your car. The Playmobil Funpark is two kilometres away; this route takes about five minutes. The name says it all: every single room at the CineHotel Maroni is dedicated to a famous Hollywood film and decorated accordingly – from Indiana Jones to Lord of the Rings. This creates a very special ambience. WLAN and parking spaces are free of charge. Many guests praise the gastronomy and especially the breakfast buffet. Another advantage: The three-star hotel is located directly on the market square of Zirndorf – there can hardly be a better starting point for a shopping stroll or a visit to a café. The two kilometres to the Playmobil Funpark can be reached in five minutes. A good 6 km from Playmobil Park is the NH Fürth. The typical four-star hotel is actually aimed at business travellers. But if you want to explore the city centre of Fürth as well as the Playmobil Funpark, the NH Hotel is an excellent starting point – after all, the hotel borders directly on Fürther Freiheit with its shops, market stalls and restaurants. The NH Hotel accommodates well over 100 rooms, all with air conditioning, flat screen TV, free WLAN and shower (some with a bathtub). For the drive to the Playmobil Funpark to Zirndorf you should plan about 15 minutes. If you are looking for a cosy, simple accommodation near the Playmobil Funpark, you will find it at Pension Kettler in Oberasbach: The rooms are available in different sizes, the prices including breakfast vary accordingly between 28 and 34 euros per person in a double room. Children up to 15 years pay only half if two adults book at the same time. Especially recommendable is the Gasthof, which offers typical Franconian, homemade specialities. The Playmobil Funpark is just a five-minute drive away. You can find more information on the website of Gasthof & Pension Kettler. Until the end of 2017 the hotel was called „NH Forsthaus Nürnberg Fürth“ – after reopening under new management the name is „Hotel Forsthaus“. Of course nothing has changed in the great location directly at the Fürth city forest: Joggers, hikers, cyclists, mountain bikers and Nordic walkers start their morning or evening rounds right outside the front door. The well-known wild boar enclosure is only 200 metres away. But first and foremost you can stay overnight in the traditional Hotel Forsthaus. The four-star hotel offers spacious rooms including flat-screen TV, minibar and desk; there are enough free parking spaces in front of the house. In the house there is a forest restaurant that serves traditional Bavarian cuisine from 6 p.m. – in the summer months also in the adjacent beer garden. The hotel bar is open until midnight. Other amenities include a wellness area with pool, sauna, steam bath and solarium. 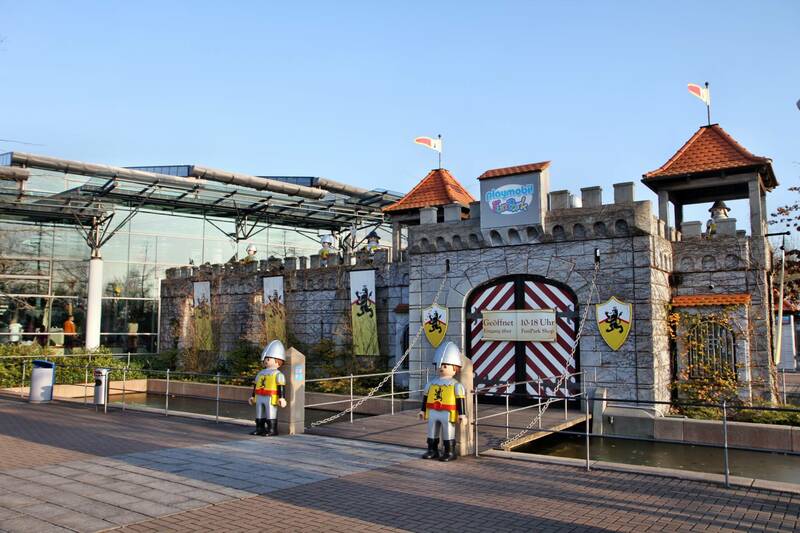 By car you can reach the Playmobil Funpark in about 15 minutes – Nuremberg city centre is 20 to 25 minutes away. What name would you choose for a pension located at a bridge? Exactly: „At the bridge“ („An der Brücke“). The inn, idyllically situated on the small river Bibert, is only a few minutes‘ walk from the Playmobil Funpark. The guesthouse offers double, triple and quadruple rooms, all with shower, WC, TV and car parking. Breakfast is also included in the price. The double room is already available for 65 euros, the four-bed room for 85 euros. If you want to spend your holiday in Franconia, you can stay overnight in the spacious holiday apartments. You can find more information on the website of the guesthouse „An der Brücke“.